Here NI is a community organisation and registered charity based in Belfast. We’re here to support lesbian and bisexual women and our families and improve the lives of L& B women across Northern Ireland. We do this in lots of different ways; through providing information; developing support networks; providing one to one support; facilitating training; lobbying government and agencies on your behalf; offering a community space for meeting and much more. 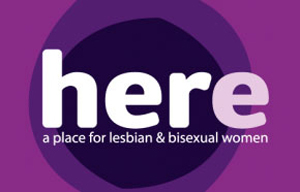 Whether you want to connect with other lesbian and bisexual women in your area, find out about your rights, learn new skills or get involved as a volunteer, just get in touch or drop into our office in Belfast city centre. You can also explore this website to find out more about the services we offer and you’ll find lots of useful resources to help with any question you might have. In 1999 a number of women met in Belfast to explore the idea of establishing an organisation to support the needs of lesbian and bisexual women throughout the North of Ireland. The group became known as Lesbian Advocacy Services Initiative (LASI). A report was commissioned by the group which detailed the experiences of lesbian and bisexual women here and recommendations were made about the type of organisation that might meet our needs. The report, A Mighty Silence, was published, and launched at Stormont in 2002. LASI was awarded a grant from the Community Fund in 2004 to employ a worker for three years. Much of the work done during this period was directly related to changing and improving legislation and LASI was directly involved in supporting, for example, the introduction of Civil Partnerships and the Equality Act around provision of goods and services to LGBT people. LASI secured a further 5 years funding from Big Lottery’s Reaching Communities Fund to enable the setting up of a staff team; co-ordinator, development worker and part-time administrator. With a renewed emphasis on community outreach, capacity building and connecting women, LASI rebranded as HERE NI in the summer of 2012. Our name reflects the importance of visibility for lesbian and bisexual women and the idea that HERE is wherever we are….which is everywhere!